Book of Mutter – loudlatinlaughing – Euge! Euge! 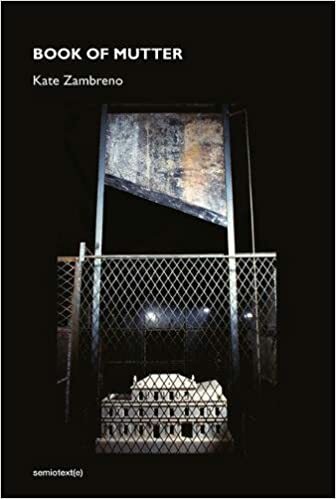 I will read every book that Kate Zambreno publishes, but this will not be one of my favorites (that honor goes to Heroines and Green Girl). I’m just not a sucker for the drama of the mother-daughter relationship, with the daughter left scurrying about trying to make sense of it all in the aftermath of death. But once again she’s introduced me to a whole cast of characters, weaving in Louise Bourgeois into the story, reminding me of Henry Darger, and creating a compelling tale through sparse, tight, poetry. All the women Louise Bourgeois collected like these fragile glasses, women I also collect, fictional and fictionalized, that I abandon myself to in acts of intense research and investigation—Anne Sexton, Antigone, Marilyn Monroe, Medea, Ophelia, Cassandra, Sylvia, Virginia, Zelda. Addendum: Barbara Loden, Nella Larsen, Diane Arbus, Shulamith Firestone, Valerie Solanas, Susan Sontag, Kathy Acker, Chantal Ackerman, Louise Brooks. Any woman remote and unknowable. Any woman furious and desperate. I collect them for my mantle. In her acknowledgements, she mentions that while she was finishing up the book (it lingered over 10 years), she found out she was pregnant. I hope that this addition to her life does not take her or her intensity away.